ACT Fibernet, India’s largest non-telco ISP and 3rd largest ISP (internet service provider), has announced upgradation of its existing internet plans for customers in the city of Hyderabad. 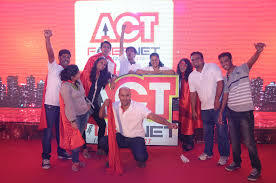 At a similar upgrade in October 2016, ACT Fibernet had increased its entry level plan A-Max 410 from 1 Mbps to 2 mbps and is now taking it to a new level of 5 mbps with an exceptional download and upload limits of 60 GB each, making it the only internet package in the market to be offered at such a phenomenal value. Likewise, A-Max 650 has been upgraded to 25Mbps versus its previous offerings of 10Mbps with new upload and download FUP of 100 GB at no extra costs. A-Max 1050 is being upgraded to 60 Mbps from speeds of 40Mbps with new upload and download FUP of 200 GB again at no extra costs. With over 70 per cent market share in Hyderabad, ACT Fibernet is Hyderabad’s largest and favoured internet service provider that bring the best internet plans coupled with incredible speed and reliability to its customers. The new offerings will enable access to high speed and uninterrupted internet services to meet entertainment, business and utility services requirements.